The Congress president Rahul Gandhi on Wednesday filed his nomination papers form his stronghold Lok Sabha constituency Amethi. The Congress President was accompanied by his mother and UPA chairperson Sonia Gandhi, sister Priyanka Gandhi Vadra, and brother-in-law Robert Vadra to the local collectorate. Before fling the paper, Rahul Gandhi led a 3 kilometre long roadshow from Gauriganj. He rode on the rooftop of a truck along with Priyanka and Robert Vadra. Their son Raihan and daughter Miraya were also present. 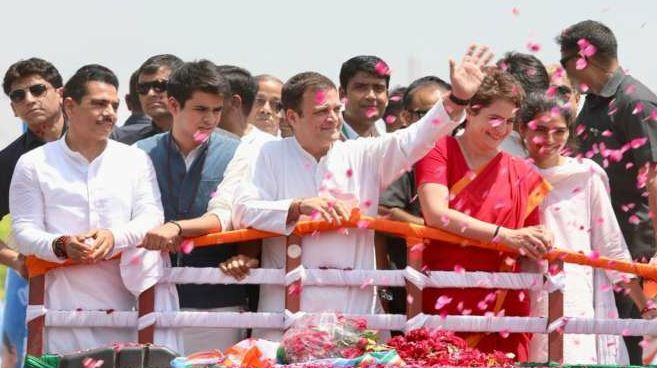 A massive crowd of supporters walked on both sides of the road and showered flower petals on the Congress leaders. Many shouted slogans as Congress workers danced to drum beats. Apart from his traditional seat Amethi, the Congress president will also be contesting from a second Lok Sabha seat from Kerala’s Wayanad. Meanwhile, the ruling BJP claimed that Gandhi “escaped” to Kerala because he is unsure of a win from Amethi. Gandhi had filed his papers to run for Parliament from Wayanad in Kerala on the 4th of April. The 48-year-old Congress leader will face Union minister and BJP leader Smriti Irani in Amethi, who tased defeat against Mr. Gandhi in 2014.